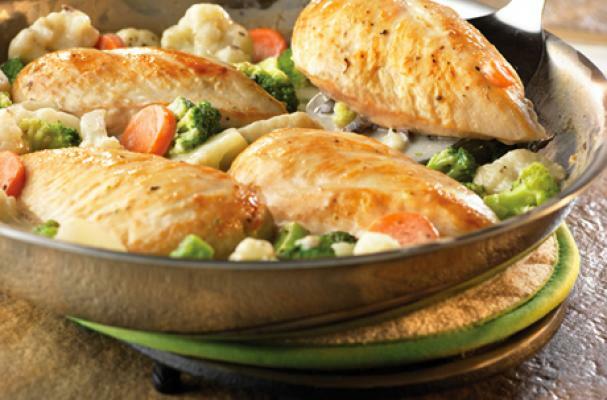 Lemon herb chicken with vegetables is the perfect one pot for your busiest nights. This quick and easy meal comes together is well under 30 minutes. If you have a hungry crowd looking to be fed, lemon herb chicken is the way to go. Step 1: Sprinkle the chicken with the garlic powder. Step 2: Spray a 10-inch skillet with vegetable cooking spray and heat for 1 minute over medium-high heat. Add the chicken and cook for 10 minutes or until it's well browned on both sides. Step 3: Stir the soup, milk, lemon juice, basil and vegetables in the skillet and heat to a boil. Reduce the heat to low. Cover and cook for 10 minutes or until the chicken is cooked through.